Currently available as a 3 disc (2 CD / 1 DVD) Definitive Edition which includes a 5.1 Surround Sound mix of the album. NB: The Virgin CD re-issue of the album released in 1990 included the demo version of "Master of Time" (which was recorded in August 1973) as an extra track. composed by Anthony Phillips and Michael Rutherford. Anthony Phillips: Acoustic 12 String, 6 String, Classical Guitar, Electric 6 & 12 String Guitars, Basses, Dulcimer Guitar, Bazouki, Synthesizers, Mellotron, Harmonium, Piano, Organ, Celeste, Pin Piano, Drums, Glockenspiel, Timbales, Bells & Chimes, Gong. Vocal on Collections. Michael Rutherford: Acoustic 12 String, 6 String, Classical Guitars, Electric 6 & 12 String Guitars, Basses, Organ, Drums, Timbales, Glockenspiel, Cymbals, Bells. Phil Collins: Vocals on Which Way The Wind Blows and God If I Saw Her Now. Note: The Esoteric Records release was a limited edition vinyl pressing of the album released especially for Record Store Day (18th April 2015). Copies of the LP came with a postcard signed by Ant. (i) The Passport CD re-issue was done without Ant's involvement from an inferior tape source, which had been partially demagnetised in places. This accounts for the 'fluttering' sound heard in places on this CD. (ii) The Virgin CD release was re-mastered by Simon Heyworth and Ant from a Trident Studios production master. This was the only available master tape source for the album at the time the Virgin release was being put together. 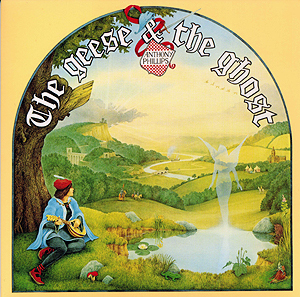 (iii) The initial pressing of the Virgin CD release had the artwork sourced from the Passport CD, which added the text 'with Mike Rutherford and Phil Collins' under Ant's name on the front cover. It also excluded the lyrics to the songs and the text to accompany Henry: Portraits From Tudor Times together with the credits for the musicians who played on the album. The reproduction of the artwork on this initial version was very poor and it was subsequently replaced with an improved version based on the original album release. The 2 CD re-issue of the album is the first CD release of the album to be sourced from the original master tapes, which were re-discovered in 2001. The artwork for the album is also reproduced to a much higher standard than on the previous CD releases. Disc one of the 2018 Japanese release is in SHM (Super High Material) format. The Definitive Edition of the album was released in a clamshell box with a small poster. The second CD includes the previously unreleased track Only Your Love, and the set also includes a 5.1 surround sound mix of the album by Andy Miles and Simon Heyworth. There was one single taken from the album - a promotional release which was only issued in France by Vertigo Records. Featuring Collections and God If I Saw Her Now, this is now a very rare and collectable item.